It was a hot, dry day--perfect for making hay! 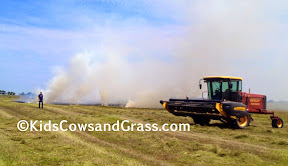 With temperatures near 104 we worked hard to cut the nutritious summer grass in the morning so it could dry and we could make it into bales by that evening. My son was driving the swather ( so named because it cuts the hay and then lays it down in a piled up row called a swath) and things were going well. But when he looked back to check the row, he saw a little spiral of smoke. The little spiral quickly turned into a flame with white smoke rolling! He called me on his cell phone to bring water as he ran back, leaving the swather a safe distance from the growing fire. He tried to stomp out the flames but they grew too fast in the dusty dry grass. On my way, I called 9-1-1 that would bring the local volunteer fire fighters to our aid. By the time I arrived (probably 10 minutes after his initial call) the fire was out of control. Luckily there wasn't much wind or we would have had a real mess. Within 20 minutes the fire truck had arrived and the well-trained volunteers had the fire out and things back under control. These people are our neighbors and friends--farmers and businessmen, taking time off from their own job to help us! They are volunteers who are committed to keeping our community safe. Our fire was pretty easy for these guys! 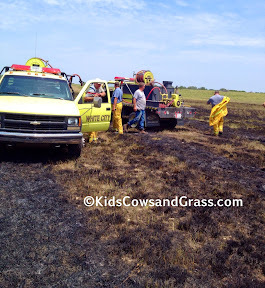 We lost approximately an acre of grass and the fire will damage the quality of grass that regrows for years. An acre is the size of a football field, so there is a large black spot in the middle of our field. 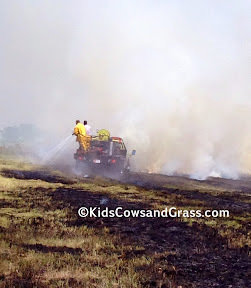 We determined the cause of the fire was the cutting knives on the swather striking a flint rock, tossing a spark onto the dry, highly flammable grass. Farming can be pretty dangerous, but rural friends look out for each other. Glad it was no worse - that your son and the equipment weren't hurt. . . . . and thankful you didn't have strong winds!! You are so right! We were very lucky!! So sorry. When you're up against brick walls and you're willing to get out there and chew them, just to have something like this happen... it just stinks. I hope y'all are able to finish up without anymore trouble. Yep! We finished the work the next morning and had no more trouble. On a farm, there is always work to be done and hassles galore!! We are just lucky that it wasn't a worse mess!